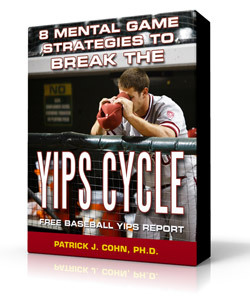 The throwing yips is no doubt the biggest fear of any baseball players and the most frustrating experience for players who can’t seem to break free of the yips. The yips doesn’t just affect your throws, it messes with your head. 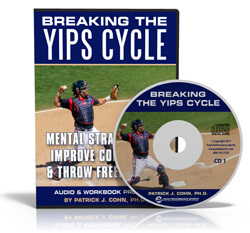 The yips feed off your fear of making errant throws or consistently missing the target. 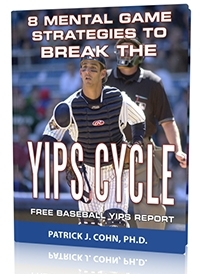 It is your negative mindset of fear, negativity and counter-productive emotions that make baseball player’s feel trapped in the yips cycle. Pitcher Daniel Bard was on his way to becoming one of the elite relievers in the Major Leagues but the yips put his career on hold. From 2009-11, Bard was a dominating pitcher for the Boston Red Sox from 2009 through the first half of his 2011 season posting a 2.88 ERA, averaging 9.7 strikeouts per nine innings and only 3.5 bases BB/9 in nine innings. Bard starting yipping in the second half of 2011 season and he has never been the same pitcher since. The second half of the 2011 season, Bard posted a 5.28 ERA in 28 appearances. The Red Sox tried to shake him out of the yips by converting Bard to a starter but he never regained his form and his ERA jumped up to 9.00. Bard was given a minor league contract by the Texas Rangers but he couldn’t shake the yips. In his brief Texas stint, Bard hit a new low allowing 13 earned runs over four appearances without allowing even one hit! Bard gave up those 13 runs by walking nine batters and hitting seven other batters. The yips issue has been difficult for Bard. Work smarter, not harder – I requires “mental finesse” or poise to win out over the yips instead of brute force or battling the yips. Fighting the yips by working on the technique of throwing only serves to keep you over-focused on the problem. Explore mental training options to win out over the yips: learning to relax or trusting you ability to make the throw or focusing on something other than mechanics. You can then apply the same mental skills to improve other areas of your game.